To leave feedback, send us an email to marketing@a-b-c-plus.com. "First of all, I LOVE what your ABC's GRP and Pro Bi have done for my beautiful 10 year old gelding - and my peace of mind! After volunteering at the Colorado Horse Rescue for over 10 years, I found my equine soulmate there and adopted my first horse last May (at age 66!). 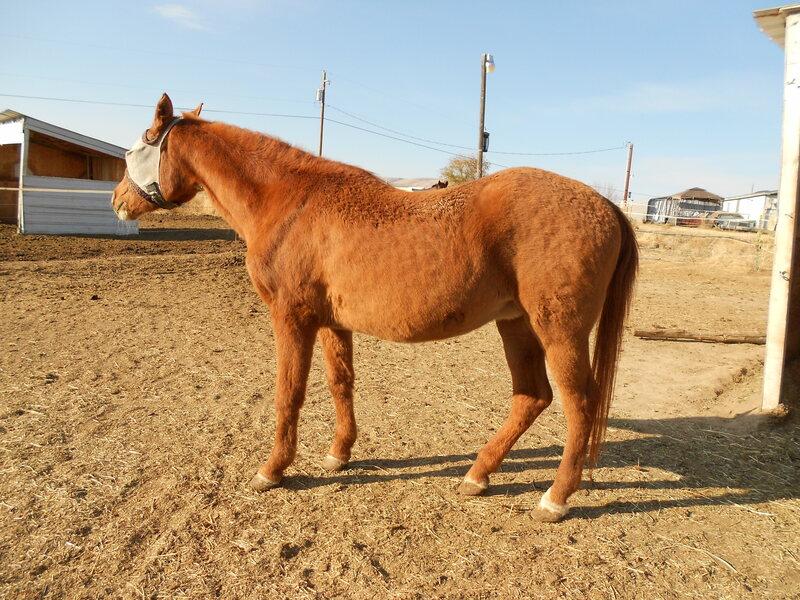 Gulliver developed some gut issues after moving from a dry lot at the Rescue to a grass pasture, even though it was done gradually. So upon a nutritionist’s recommendation, I tried Pro Bi. At first he wouldn’t touch it, so sitting in the barn and feeling disheartened, I called your office and spoke with a wonderful woman who suggested diluting it with water and mixing it with his grain. Perfect! Gulliver then had some major gut issues after fall worming and the stable changing its hay supplier, so the nutritionist suggested your ABC’s GRP. It took him a while to accept it, but now he loves it mixed with his grain and Pro Bi, and the results have been wonderful! I wanted you and your company to know you have made such a difference in the lives of a woman and her beloved horse. Thank you so much!" "I use and love Dy's Liquid Bandage. Its ability to quickly heal a wound in humans and animals is amazing! Plus being all natural I'm not afraid to handle it! I always have it in my medicine cabinet!" 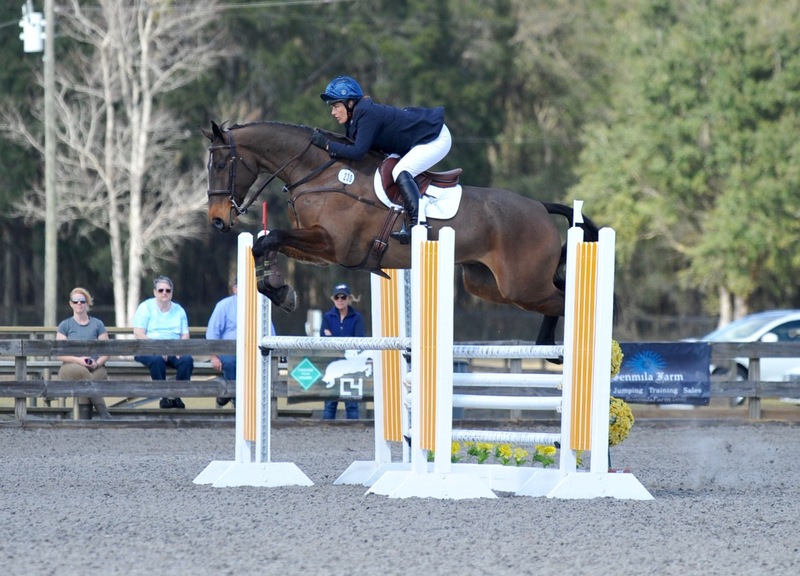 "Here are a few pics of my horse Malabar 54 competing! I have used ABC's Plus and Pro Bi for 20+ years and just love how great my horses look! I very rarely have ulcer problems, even during the heat of competition season and my horses just have a wonderful glow to them! It is the one constant that never changes with my program!!! Thank you for all your wonderful support!!! Cheers! Liz :)"
Julie’s filly, Xena, was born in April 2015 and broke her leg just 2 days after being born. 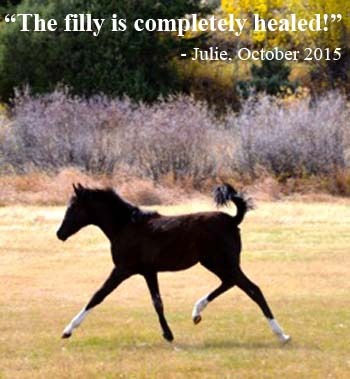 As Julie describes, some vets would have put down a horse this young with a leg fracture, but Julie and her vet were determined to heal the leg. Click here to read Julie’s inspiring story. "This is my 7 year old Hanoverian/Trakaner mare, Winnie. I have owned her for about 3 years. Since the day I brought her home, she's been on ABC+ products. She does the best on the Reg's Custom Mix. With a high quality hay, all she eats at meal times is a scoop of Reg's. At horse shows, people stop me and ask what I feed her because of her beautiful and glossy coat. They can't believe I'm not feeding her some kind of (messy!) oil. Also, being at a large boarding facility, there is nothing more convenient that having the am and pm feeders simply give her a scoop, no messing around with multiple supplement baggies or pre-splitting portions up. 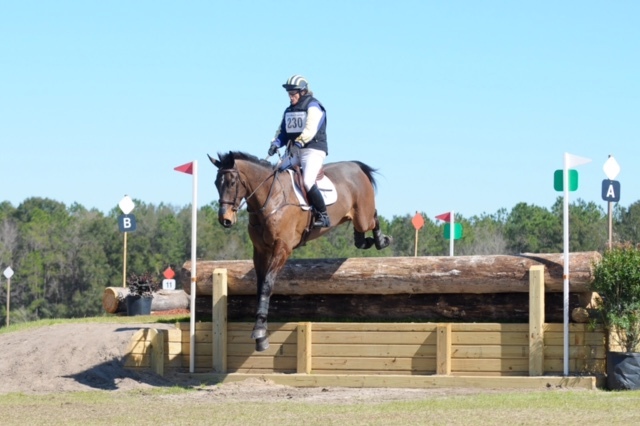 I would recommend the Reg's Custom Mix for any performance horse, it helped Winnie become the ultimate performance horse." "I just came back from being gone for over two weeks. We ran out of Jim's Organic Grain, and I can really see how the absence of this has caused stress to my old blind mare. She was doing so great, and after being off the grain for two weeks, she is ribby again. That is such great stuff!" I am so sorry that I did not know about Jim's passing. He was such a great man. He was a friend to UMECRA for sure. Such generosity! And although he hadn't competed in a while, I always enjoyed riding with him. Remember many rides when he on Lovie and I on Shannon were 1st Hvy and 1st Lt weight. I want to thank you for sponsoring Top Ten Mile horses again this year. My mare, Ella, was Res. Champ with 860 miles. She also won National B.C. for the second year in a row and National War Mare. I am 100% sure that your products have aided in her continued success." "Hello: I just wanted to let your company know how thankful I am that I found your product. My young horse was starting to have an attitude change (was always grumpy and unwilling to do things), was very irritable and spooky, and he was having a hard time keeping weight on, etc, ultimately he was diagnosed with ulcers and I treated him accordingly. Since the treatment I have placed him on A.B.C. 's Plus (the regular formula) and he has put on weight, has a shiny coat, he's personable now (and has his ears up all the time), and I have completely taken him off calming supplements. I cannot believe the difference in my horse, and this is the only product he's on! Thank you!!" I've used A.B.C. 's Plus Digestive supplement for around 10 years. Not because either of my two horses has any issues, just because it makes sense. I was pleased to see the Organic line a few years ago and have been ordering that since. Big praise for selling Genesis Organic Horse Grain. I bought that for a while until my local feed producer worked with them and one of their distributors to produce a similar product that is 3/4 sourced organic/locally in the southeast and still some from Canada but in bulk so it is more affordable. And I LOVE your Glyphosate policy and A.B.C. 's G.R.P. product. I’ve attached a few pictures - One is of Dove’s foot. Jim told me that it takes about four months to grow a new hoof, using ABC's protocols. Well, Dove has been on ABC since the end of July, and the hoof growth on her foot is amazing. My farrier even commented that he was impressed with how noticeable the new growth was. 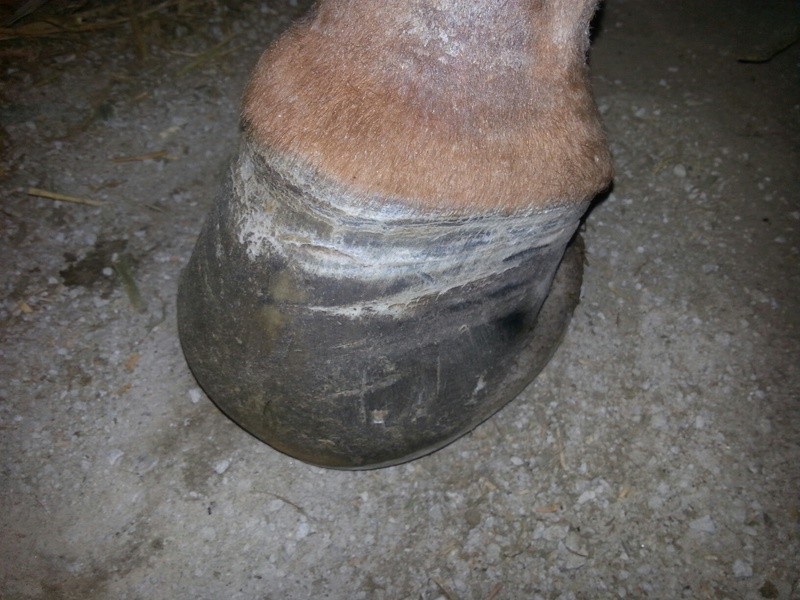 You can see the lines and changes in her foot, from unhealthy to new healthy hoof. I thought it was awesome. Big testimonial for Dy's - I’ve also sent a picture of Dove's ankle, where the stitches were. You can't hardly see anything, and the stitches have only been out for two weeks. It looks awesome, you can't even feel any bumps or anything! I think it eventually there won't be anything. Also just sent a picture of Dove, even with winter hair I couldn't believe how amazing she looks, how red and deep her sorrel color is, and shiny, even with a winter coat. I started an off-the-track four year old on ABC’s Plus last week. Since she's been here the end of September, she's been up and down on weight gain and condition. But, most importantly, she's always had really loose stool and sometimes diarrhea. That has all stopped since she's been on the ABC’s Plus, can't wait to see significant weight gain! "Now that there is such a happy ending, I've decided to put this experience into words. In April of this year, one of my clients called me to say that her horse was going through a small white salt block once a week, drinking 4-5, five gallon buckets of water per day (along with oceans of urine), eating his poop if it wasn't picked up immediately, and laying down sleeping all day in his stall. When taken out of his stall to be lunged, he acted insane, and he was a nervous wreck ALL the time. If you took him somewhere you couldn't tie him to the trailer and leave because he would go nuts, so a human had to be with him at all times. Thank goodness this horse was so loved and adored by his young owner, that she had the patience and was willing to do whatever it took to make him better. Now mind you, it wasn't one of those things where one morning this lady woke up and her horse was acting crazy. It came on slow, and got progressively worse and worse as time went on. The first thing the two of us did was to take a look at the tag on her horse feed, and THAT told us a lot. 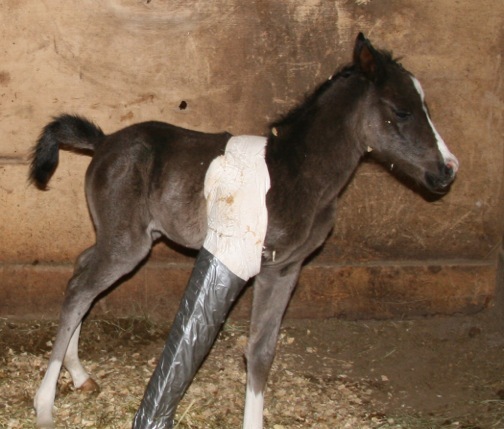 This horse was being starved nutritionally by the owners of the facility where her horse was boarded. The few minerals that were in the grain were of poor quality and small quantity. It was literally one of those "ah, ha" moments. I thought this horse was needing some magnesium to balance out the low quality calcium in his feed, some ABC's Plus, and probably some IONS. I should have known that Jim had a "better idea", as he usually does. He told me to put him on free choice Rush Creek, along with the IONS, and ABC's Plus. Here I thought I was being so clever, but deep down inside I sensed he was going to need more minerals than just the magnesium. My past experience with Rush Creek goes back quite a few years. I had a wonderful little stallion that had been injured very badly. When I put Rush Creek in front of him, he licked it and turned away. Within an hour I could hear him playing with the little hanging feeder that he had taken off the wall, and he had Rush Creek all over his face. So, I put more in front of him and he scarfed it down immediately. Even though it is free choice, when a horse is really starved for minerals, you let them eat as much as they want for as long as they want. When their body has had enough, they will stop. It's just that simple. That exact same thing happened to this client's horse. He ate the Rush Creek like it was candy. Then one day he just stopped. He was quiet, calm, no more eating poop, no more excessive salt or water drinking, and no more frantic terror attacks if he was left alone. I don't recall when I have seen a young lady so happy to have her friend and companion back to normal. Everyday he gets his ABC's Plus and now that we are into the winter, she is keeping him on IONS to encourage him to drink the colder winter water. Thanks so much Jim...you are the BEST, and you always manage to make ME look so good!!!! Have a Merry Christmas and a VERY Happy New Year!!!" I have been using ABC’s Plus for the last 21 years. I have a little Arabian mare who is now 34 years old. I have had her on the ABC’s Plus, alo ng with her son, whom I also still have, who is 24 this year. ABC’s Plus I believe is the main reason she is still with us. A few years ago, she had a tapeworm she picked up on our new property we moved to, and with that and her losing her molars over the last few years she was losing weight fast, so I upped her dosage to 8 oz daily of ABC’s Plus and healed up her bowels from the tapeworm we killed off. Over the next year and a half, she re-balanced herself, gained her weight back, and to this day in January 2012 runs around like the boss mare she is, and everyone else is younger and bigger than she is. She also sheds out nicely by late June. Here is her picture. Thank you Jim for such an awesome product and product line. It is the one supplement I will not allow my horses to be without." “My horses have been on ABC products for about 18 years or so. My eldest horse, Sunny, in his last few years at ages 35-37, had some digestive issues crop up. Hey, he was in his mid-30's after all! around from not eating for 6 days to coming back into great health and gaining his weight back, right up until he passed away at 37. Sunny was not eating for about 6 days. Here he was lying down and we thought that was it. His best buddy was the standing protection and support around him, he lost weight too.I'd feed Sunny carrots and ABC’s Plus and he perked up and began eating again, slowly. So I just kept giving him however much he would take of the ABC’s Plus he'd eat 3-4 times a day. Usually it was about 2 ounces at a time. Second Picture (right) - "Sunny, me" from November 2008, - 11 months later. Looking pretty great for 36! After a few days of this, he began eating his soaked rolled oats and alfalfa meal again and began picking back up. The last picture is 5 days before he passed at his birthday party, all decorated up.Still in good weight at 37, with excellent blood work even though he was ready to go, which he did naturally (not euthanized) 5 days after his 37th birthday party. Photo is a 2011 colt STORR (Stallone / Ockeross) – one of the wonderful babies that was born at Centaur breeding Farm in 2011. I have to share with you just how delighted I am with the ABC’s Fortified! As you know, Sue is retired which meant I needed to find another horse for endurance. I’ve been riding Shelly for several years and though she is not a Rushcreek Dee, she is a very nice mare. Shelly has always been a little on the pokey side which is okay but there again not like Sue! This spring I decided to offer the mares the Fortified and the first thing I noticed was they shed their coats faster and had a nice shine. Next I noticed that Shelly seemed to feel better when I rode her alone in the desert, more willing to move and not so pokey. On Monday, April 23rd, I took Shelly to a 50-mile endurance ride in the Prescott area. My husband and I were absolutely amazed with Shelly’s performance! She has never moved faster, nor had such energy. She wanted to GO the entire day in spite of the 90 degree temps and the mountainous terrain. My arms are sore from trying to maintain control! I never had to wait for her pulse to drop, immediately vetted through, and at the end of a tough day, she crossed the finish line with a pulse of 56 and a 6th place finish! I believe the ABC’s Fortified is giving Shelly the vitamins and minerals that her system appeared to be lacking and is making a huge difference in her attitude and performance. Last year at about this time, I followed up with you per the recommendation of Dr. Mark DePaolo, one of our medical advisors and our chiropractic/acupuncture practitioner, regarding a mare for whom our traditional vet had not found answers to resolve her multiple issues before an apparent allergy to “no-see-um” gnats caused her so much itching the stress generated laminits of her feet! She had many confusing symptoms and unusual behaviors (for her) that led us on a very convoluted treatment path using the process of elimination method and not giving us the whole picture. Meanwhile, her condition became critical. After further discussion with you and Dr. DePaolo, we suspected that the worms we had observed since she came to us but were unable to eliminate (our vet suspected that they were non-reproducing adults resistant to traditional wormers) were a big part of the itching problem, not just the gnats. But her entire bottom was raw with her obsessive itching! She looked like a baboon. We wanted to stop and stabilize the laminits before hitting her with a 5-day Panacur Pac systemic wormer, which would only add more stress to her system. We had done a hair analysis and discovered a selenium deficiency, so ordered your Vitamin E and Selenium supplement. Per your advice we began feeding your free choice Rush Creek Mineral, NOMS, Diatomaceous Earth, and ABC’s Plus to stabilize/boost her gut and immune system. The worms started immediately evacuating! Literally gobs of them came out for several days, tapering off through the rest of the week until her feces was clean. We continued using your natural products since then to ensure a healthy balance for her during the year it has taken to regrow new hooves and recover her health and mobility. We will be keeping her on these products as well as garlic/yeast (to help with her gnat allergy) and continued gut/liver health. “We were trialing your Poultry VTM and DUA when we were notified by the State that two birds infected with Avian Influenza had been brought to a home flock within 1/2 mile of us. Our 600 birds were quarantined to the farm until two rounds of testing two weeks apart could show that our birds were not infected. Finding a single infected chicken meant the State would depopulate the whole farm birds, followed by disinfection and 21 days waiting before new birds could return, followed by another round of testing the new birds. I used both of your products at the recommended rates, plus raw apple cider vinegar in the drinking water. A month later, our final testing showed no infected birds! What a relief. I am certain that supporting the health of the chickens with a diet of organic feed, ranging on pasture, a splash of vinegar and your quality premix prevented our birds from getting infected. A flock between us and ground zero did get infected and another flock a mile and a half away got infected. I have now placed my order for more Poultry VTM and DUA. 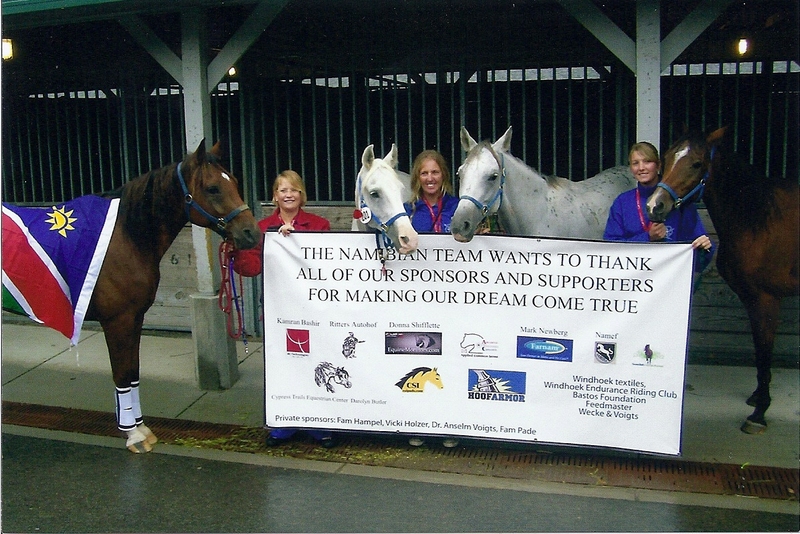 “I just wanted to thank you for your wonderful product – I am an endurance rider and use Pro Bi at the rides. This weekend, I had a horse develop impaction colic following a change of weather. I remembered a speaker telling me at Julie Jackson’s clinic last year that if I gave my horse Pro Bi, I would have a horse to treat when the vet arrived. The vet would not make an emergency farm call late at night on a Sunday and told me to come to the clinic Monday morning. I was desperate – I gave my horse banamine and Pro Bi and said a few prayers. I am so happy to tell you that after two days in the hospital, my horse made it home without surgery. I credit Pro Bi for keeping the gut intact. "Several years ago, we purchased a coming 2 year old Tennessee Walking Horse gelding, long winter hair and all, that we nicknamed "Scooter." The next spring, we sent him to the trainer's to be broke, and when he returned home, he was in need of his first set of shoes. 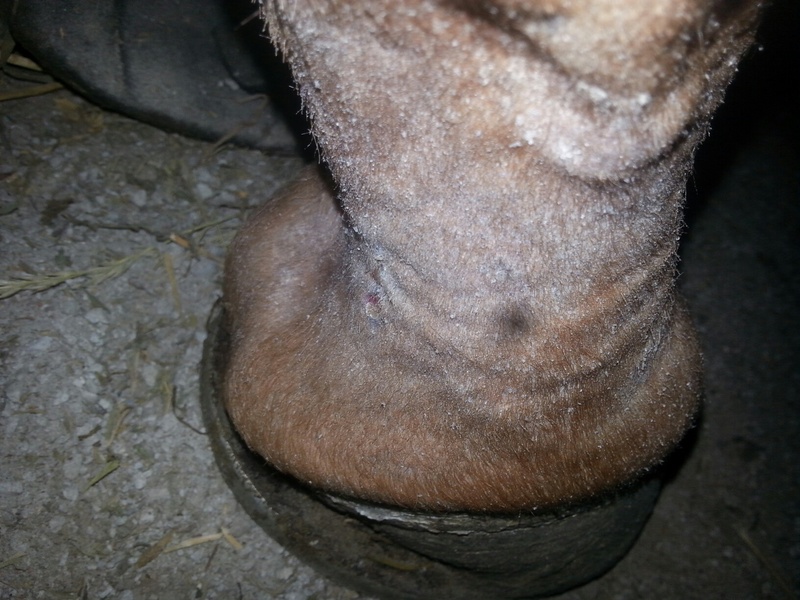 When our farrier came to trim and set his new shoes, he commented that the white area inside the walls of Scooter's hooves was honeycombed. He got the shoes on with no trouble, but much to our dismay and to the farrier's, we both found out that Scooter could hardly keep his shoes on long enough for the farrier to get down the driveway, around the corner, and out of sight. The farrier, after having become tired of having to repeatedly return to replace Scooter's thrown shoes, suggested that we put this gelding on ABC's Plus, HOOF, and Rush Creek Mineral. We took his suggestion, and Scooter's hooves grew like wildfire. After the old hoof had grown completely out, the honeycombing had disappeared, and a healthy elastic hoof emerged. Needless to say, this experience sold us on ABC products. We have all of our horses on ABC today. We have also noticed one other thing that we attribute to ABC. 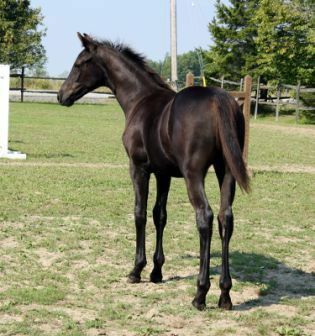 We raise Tennessee Walking Horse foals. 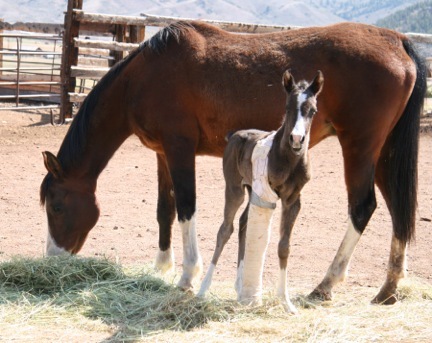 We have noticed that we have gotten more size and growth from the foals when our mare was fed ABC during gestation, and the foals during their growing years, than the ones that were not on the ABC regimen. Could that be another reason why it is called ABC's Plus?" "This is a short story about Ole Roy, a 20-year-old Palomino Quarter horse who nearly died of colic in July of 2012. On a Friday evening in July 2012, a powerful storm blew 5 bales of alfalfa hay from a loft, into the pen of Roy (20-year-old Quarter horse) and a mule. Roy's gut was stuffed full of hay when the owners (Jean & Don Brown) found him the next day. Only three bales of hay were recovered from the pen. Saturday afternoon, Roy was in trouble when he started rolling & thrashing on the ground. The vet came out Saturday to treat him for impacted colic. Roy's pulse rate was 120 beats per minute. Jean & Don were up for two nights walking Roy, keeping him on his feet. Monday morning the horse was not improving, and the vet was scheduled to come to put Roy down at noon. When I heard about Roy's condition that morning, I went to see Roy and offered a large dose, 25ML, of Pro-Bi to the horse. Roy’s owners were a bit hesitant to allow me to give Roy the Pro-Bi without an OK from the vet, but I convinced them to try the product. When I left Roy, my last thought was, ‘He is not going to make it.’ Jean, the owner of Roy, continued to walk him until the vet arrived. Roy had not had passed any manure in 48 hours. When the vet saw Roy on Monday, he said that Roy wasn't ready to be put down yet, even now that his pulse rate was still at 80 beats per minute, with Banamine. The vet said, “Let’s give him another eight hours and keep walking him.” Monday evening, Roy started to pass manure. 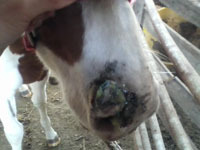 On Tuesday morning, Roy was still standing and eating a little grass hay – I couldn't believe it, neither could the vet. The owners of Roy and I are convinced that it was the large dose of Pro-Bi, and a ton of prayers from Don & Jean, as they spent two nights walking Roy, that saved Roy's life. 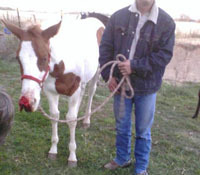 Roy still lives today with his buddy the mule, in Garden Valley, Idaho. The owners of Roy, Jean & Don Brown, gave me permission to write this story about Roy. Jean & Don are in their 70’s and no longer ride Roy or the mule in the wilderness of Idaho." "I would like to share with you the amazing turn around in my horse that has been having several bouts of gas colic and tying up. The ABC products that I ordered have helped both my horses improve tremendously. I can rest more easily now at night! I am so grateful I can afford these products and that they are available." and hooked his right nostril on it. If you look closely at the picture on the right, it is hanging. He ripped it from the inside out so the vet had to actually cut the skin more in order to sew the nostril back up to where it is supposed to be. The end result was what you see in the next picture. Our vet, Dr. Hall of Kirkwood Vet, did an awesome job of reconstructing Cheese's nostril the best it could be done as he did lose some tissue. Another driver went to ABC instead of my husband so he picked it up for us and so began the recovery, immediately! I put Dy's Liquid Bandage on the first night heavily and the next week I put it on as needed. Within 2 days the healing was noticeable. The last picture was taken 2 weeks ago. Dy's Liquid Bandage is amazing, as we never thought Cheese's nose would heal to what it looks like today, but thanks to the great people of ABC and their research, he healed quickly. His hair has grown back, and it will always look different just because he is missing tissue there, but what should have taken months to recover has only taken a month and it looks great." "This is one of the best and most natural supplements for horse intestinal health that I've tried. My horses gobble it down--it smells pleasant (kind of like sweet cured hay). I like the pelleted form and the fact I can buy it in hinged-lid buckets that are easy to open and shut with one hand. If you have a hard keeper or you're transitioning on and off pasture, this stuff is gold. I credit ABC's Plus from preventing colic after my crew has escaped a couple of times." 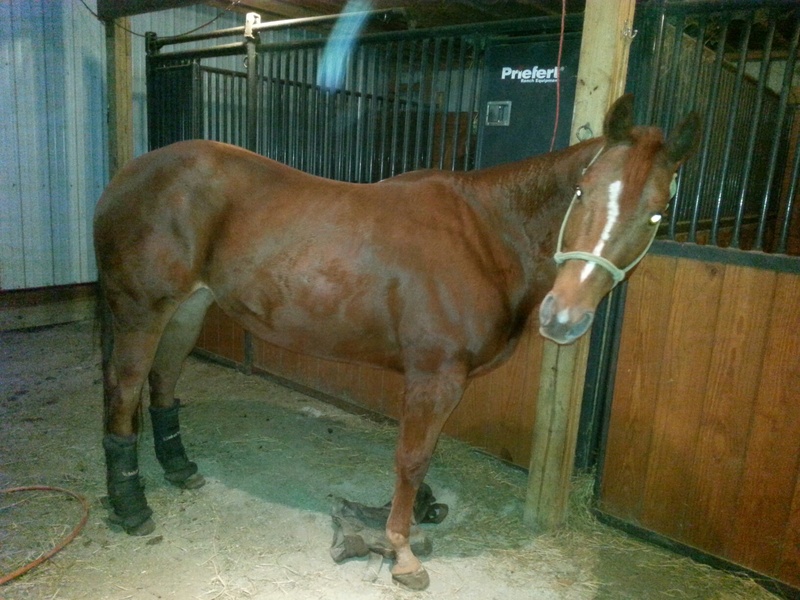 "We currently have a 7 yr old Arabian, his name is Psyche Bey Star. We noticed last summer, while he was under saddle that he was flexing out in an abnormal way. We called the chiropractor out in July 2010 to check him out, the chiropractor found that he didn't have any feeling in his hind quarters. 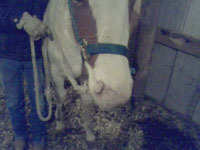 The horse was not able to hold an adjustment for even 2 weeks. He was always catching his hind end on fences, gates and trees. We were told to consider putting him down because he was constantly hurting himself even though he could not feel it. I was devastated. I called Advanced Biological Concepts to see if they had any ideas on how to fix him. They told me to put him on 3 Mins, Rush Creek, and Joint Jolt. He was already on ABC's Plus, but needed additional supplements to try and correct this problem. We kept having the chiropractor out and gradually between adjustments and the supplements, we are now able to go at least 3 months between adjustments. The horse that the chiropractor and Vet prepared me to have put down and that they said if we could get him to hold an adjustment would only be a pasture horse at best, Psyche Bay Star has now been cleared to ride again, this was a godsend. The change in our horse has been an absolute 180 and it would not have been possible without the help of ABC." "We started feeding A.B.C. 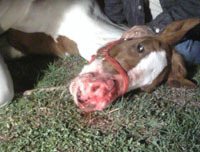 's 4 years ago when within 24 hours, both of our yearlings developed severe impaction colic from coastal hay. They spent a touch and go week at the vet hospital. It is a miracle they both survived! On the recommendation of a friend, we started all of our horses on the daily A.B.C.'s. Even the picky eaters don't mind the pellets and we have not had a single bout of colic in 4 years! It has been a life saver for us. Love it and never miss a day!" "Here are seven of the ten Top 10 mileage winners. Thank you and ABC's Plus for helping UMECRA promote the spirit of distance riding." 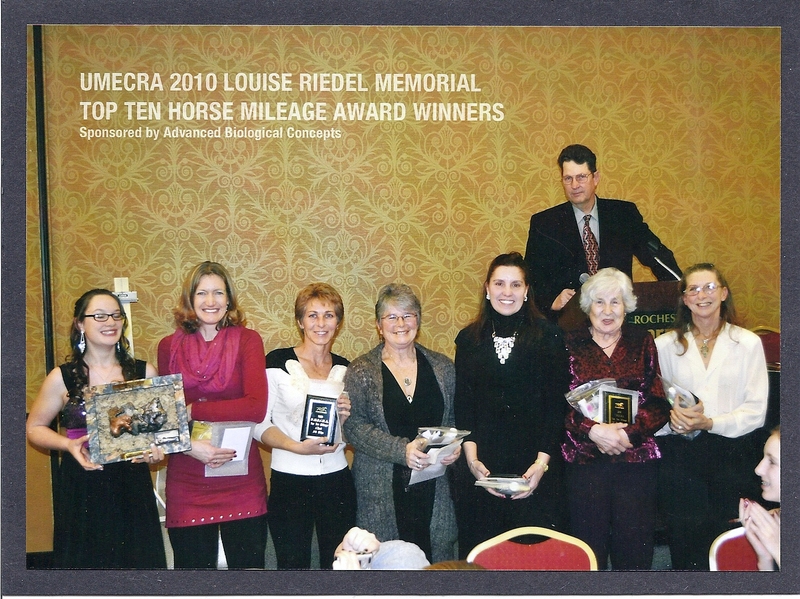 Thank you so much for sponsoring the Top Ten Mileage Awards for UMECRA. My 18 year old Morgan mare did 730 miles this season. It is so nice to have a plaque to display! "Our horses were happy, they look and feel so good and we had a BLAST at the World Equestrian Games with the support of ABC!! Thank you very much for the products that you, so genorously sponsored us. Big events like this is a once in a life time experience and your products sure helped us (our Horses) to get to that level. We really appreciate your support with many thanks." 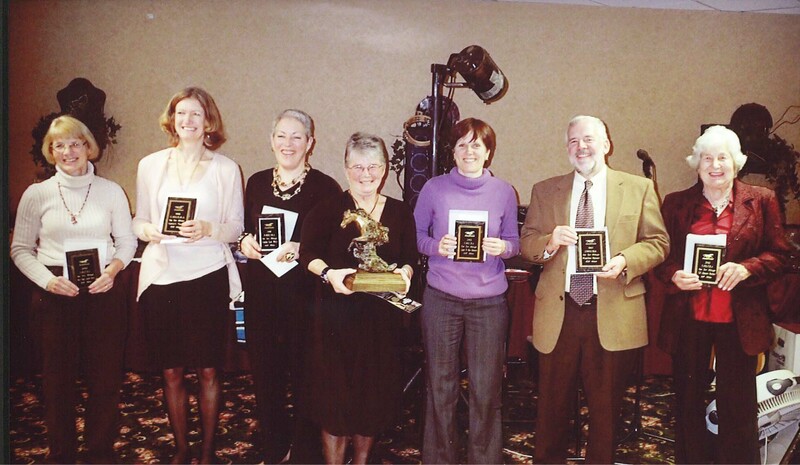 "Jim - Thank you for your Continued Support of the UMECRA Top Ten Mileage Award"